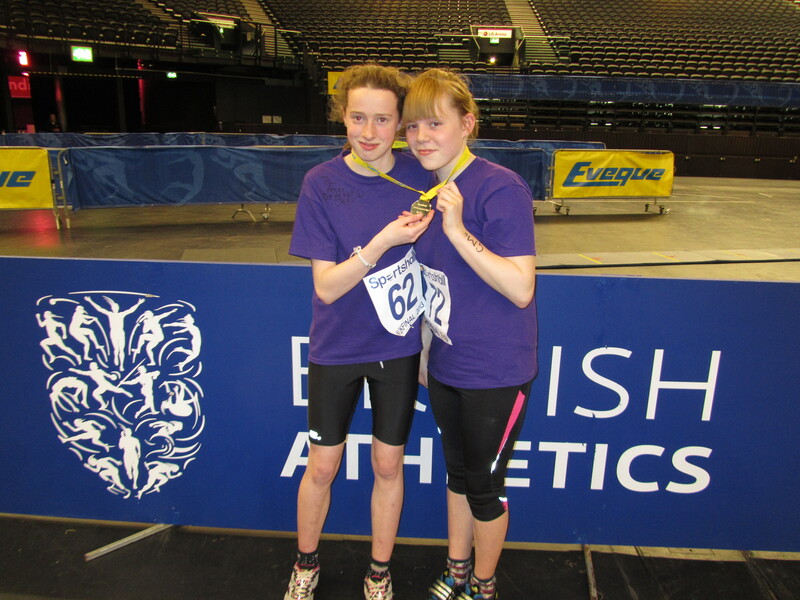 Paige Ditchfield and Regan Walker enjoyed a successful day at the LG Arena Birmingham last Sunday as part of the Greater Manchester under 13 girls squad that finished a very close third in the UK Sportshall Finals. After a long day’s athletics, it came down to just a handful of points to separate our girls from Birmingham in 2nd and the winners Hampshire. Paige threw a best of 8m70 to contribute good points in the shot putt, while Regan was 3rd in her 2 lap heat and combined with Darcie Loudon to accumulate the 2nd highest points total in the event. Regan then earned a silver medal with her team mates in the 4×2 relay. A big well done to the girls, who represented themselves and the club with distinction, bringing the curtain down on a highly successful Sp. Sportshall season for our athletes. We’ll be doing it all again in the Autumn so if you fancy emulating Paige and Regan why not get involved in our squad?. Further details will be available in early September and dedicated training sessions are planned.